Meet Kourtney Mits! She joins her mom, Rebecca Hess, to make a perfect team! Kourtney grew up in Cheyenne after moving around regularly with her dad’s military job. She grew to love the town, the people, and the culture. She claims that her experiences in Cheyenne are what have turned this place into her home, and she loves it. If you are new to Cheyenne, she is confident that you will grow to love it too! Kourtney recently got married, and she and her husband are excited to start having their own new experiences in Cheyenne, together. I recently ask her a few questions about herself. I loved learning that she is a talented musician and warned her to be ready for our RE/MAX Christmas Party talent competitions! I went to Central High School here in Cheyenne. My hobbies include music, I love to sing and I play the Violin. In the Spring I love to go for walks along trails and I love to travel whenever I can, but it’s always easier when the whether is nice. 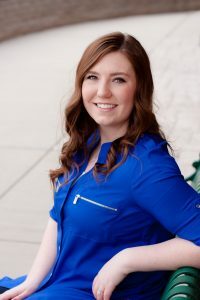 Kourtney is a passionate and driven person, and she is committed to doing all that she can to help others begin their new adventures as well; whether that be buying a first home, investing, or flipping. Whatever your dreams may be, she’s here to help you every step of the way. Give her a call or a text, 307-287-4692.